Happy Anniversary – to me! Today is my design anniversary (what I think of as my ‘designiversary!’) – eleven years ago today I launched my doodles at The Lilypad! It only seems like yesterday, time really does fly when you’re having fun! I’ll be forever grateful to the fabulous Amy Martin for encouraging me to start designing and for giving me an online home all those years ago. 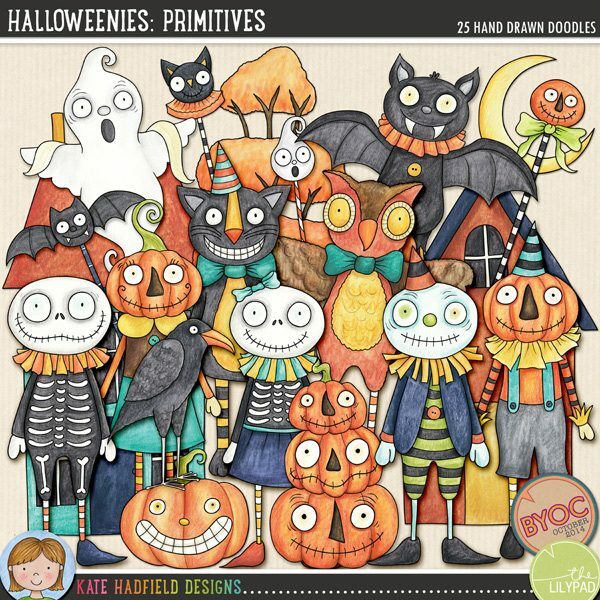 My sincere and heartfelt thanks to everyone who has supported me over the years and allowed me to carve a career for myself doing what I love – drawing and creating fun illustrations for crafty peeps! Thank you so very much. To celebrate my anniversary, I’m holding a contest, running a couple of giveaways and I also have a little free gift for you too! If you’re a newsletter subscriber you might like to keep an eye out for my emails this month for news of some subscriber rewards as well. 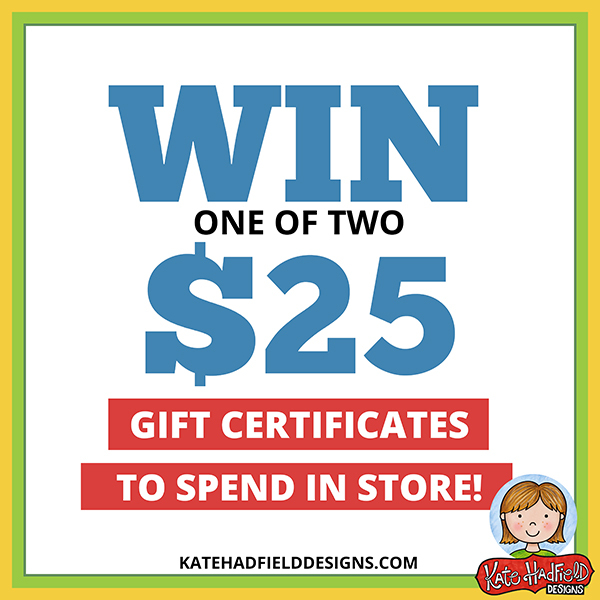 To enter the giveaway to win a $25 gift certificate to spend in either Kate Hadfield Designs or my shop at The Lilypad, simply browse through my doodles and clip art illustrations and pick your favourite set! Then come back to this post and leave a comment in the Rafflecopter box below letting me know which set you like the best. There are a number of ways you can earn bonus entries (such as visiting my Facebook page or becoming a subscriber!) – see below for details. 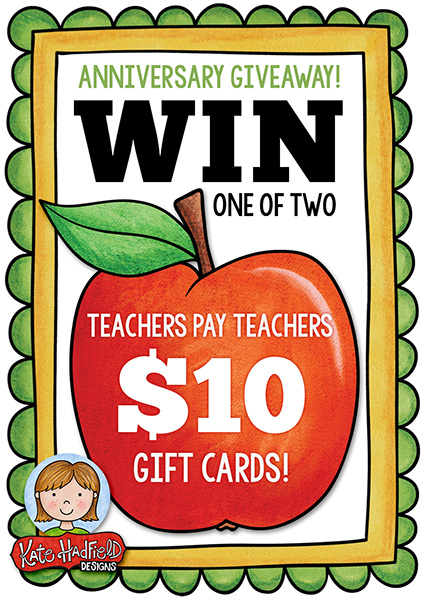 As well as a giveaway for my personal use shops, I’m also holding a giveaway to win two Teachers Pay Teachers gift certificates! The entry requirements are the same for this giveaway, please feel free to enter both if you would like to! The deadline for entries for both giveaways is 11.59pm EST 15th February 2018 and the winners will be contacted through the email used in the Rafflecopter (please check your entry carefully!) the following day. Good luck to everyone who enters! It wouldn’t be an anniversary celebration without a Custom Doodle Contest – this is the 6th year I’ve held this contest! 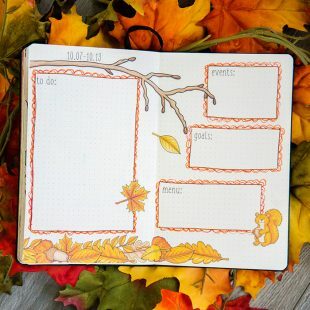 I’m pretty sure there are a few people who have entered with the same request each year (if only there were more hours in the day to doodle everything you can think of!). The winners are chosen at random so even if you have previously entered, I hope you will try again this year too. While I am sadly no longer able to create all the custom sets I get asked for, I’m excited to be able to open up a custom slot for the winner of this contest again. Just leave me a comment on this thread and let me know what themed doodle / clip art pack you would like me to create, feel free to leave as much detail as you need to describe your perfect set! You may enter more than once, but please leave a different comment for each suggestion. The winners will be chosen by random and I will work with you to create the doodles / clip art of your choice. 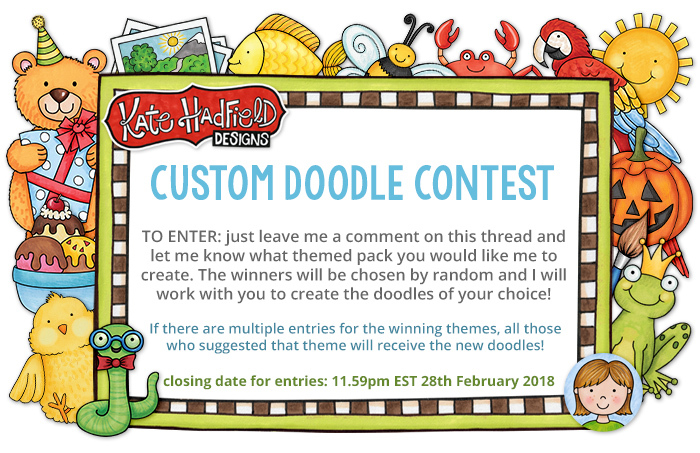 If someone else has already suggested the theme that you would like, please also leave a message with your suggestion – everyone who enters with the winning theme will receive the finished custom doodle pack for free! Only entries left here in the comments section will be entered into the draw – if you have any problems leaving a comment please contact me. If you have previously been in touch and asked me to draw a specific theme for you, please feel free to also enter this contest (the winners of this contest will take priority over other requests). Winners will be contacted by Saturday 3rd March and I will work on the winning doodle / clip art packs throughout the month. 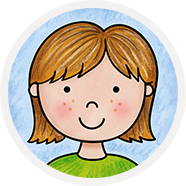 I’m looking forward to working with you to create your perfect set of doodles / clip art! Finally, I have a little freebie for you as a thank you for all the support over the years! 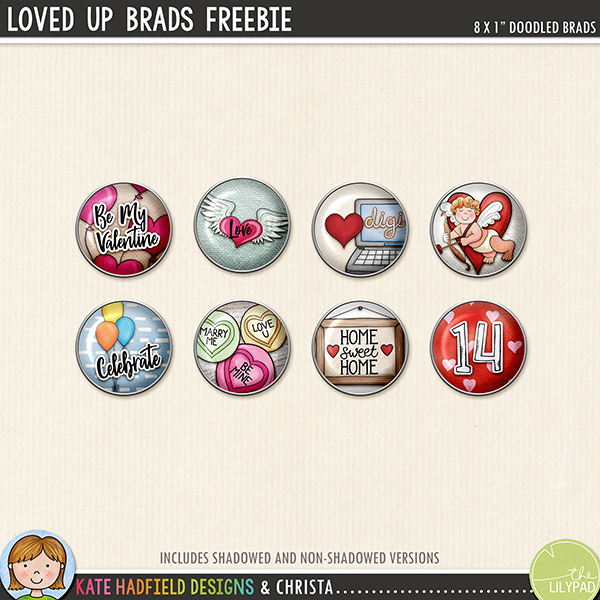 Christa has put together these lovely little doodled brads celebrating both my design anniversary and Valentine’s Day! I hope you have fun creating with them, if you do use them, I would love to see what you make, please feel free to get in touch and share your work with me! Many thanks for all your support and friendship over the past eleven years, and good luck to everyone who enters the contest or the giveaways. Here’s to the next eleven years of doodling – pencils at the ready! And I would also love to see some Italy doodles. I would also love to see Germany doodles. Congratulations! 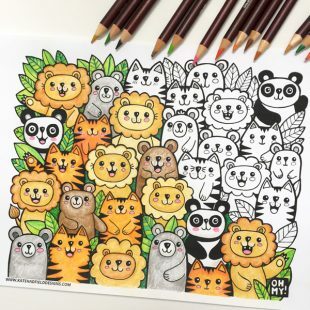 I would love to see geocaching doodles! Happy 11th anniversary Kate. I love your designs but I am from the antipodes. Would love to see some Australiana themes: animals, flowers, Aboriginal cultrure, etc. Thank you. I would love to see Scotland doodles! Nessie, haggis and heather! Congrats on 11 years!! I love a set of Kawaii things. 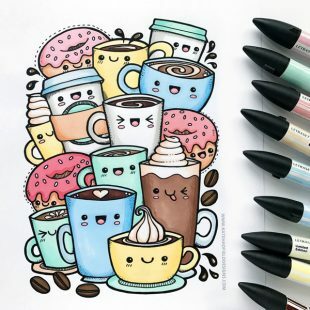 Just like your Kawaii Coffee colouring page, I would love to see donuts, coffee, cake, and all kinds of kawaii food. You have the cute “We Go Together” set, but maybe you could start a whole series of Kawaii thingies!! My daughter would have me printing them out ALL THE TIME!!! Food, Stationary, Animals… the Kawaii possibilities are endless! I would love a Gymnastics kit, particularly with a brown haired girl *wink* I absolutely adore your Karate kit and ALL of your people are just gorgeous!! A other great topic would be: animals in the meadow. With many small creepy-crawlies such as beetles, worms, ladybugs, ants, dragonflies, flies, spiders, grasshoppers, caterpillars, cockchafers, tree frogs, centipedes, snails, daisies, dandelions, bees and as a decoration different grasses, stones, plants, clouds and a sun. I’m looking forward to your new creations. Something like a wedding set was also a great surprise. With different bridal couples, rings, wedding cake, carriage, doves, church, pastor, flower girl, bridal bouquet, wedding dance, gifts, flowers, balloons and of course with many hearts. Thank you for the opportunity to bring ideas. A package of lucky symbols would be wonderful: examples horseshoe, shamrock, chimney sweep, lucky pig, ladybug, coin, fly agaric, cube, cylinder, ladder, heart, doves. A wedding package would be great. With different bridal couples, cake, rings, pigeons, carriage, church, pastor, flower girl, bridal bouquet, wedding dance and of course many hearts. Congratulations!! Here’s to many more! I’d love more ethnic doodles – as in Asian, Eskimo, etc. Happy anniversary! I would love a cowboy / wild west theme with camp fires and bandannas please! Congratulations on your Anniversary in designing. I do a lot of beach themed layouts so…. more beach items would be good. Hi! Congratulations on your anniversary! Your work is beautiful. 🙂 A great theme for your Doodle Contest would be Ocean Exploration. Thank you for the chance to create with you. Kate, Happy Anniversary. I would love to see a doodle pack featuring a Dog Agility theme – jumps, tires, a-frames, tunnels, etc. My rescue and I ran agility for several years. I would LOVE to have some of your fantastic doodles to scrap the pictures I have. Congratulations for your anniversary! Your work is amazing! I would love to see a fairytales set that would include all the most famous fairytales. CUSTOM DOODLE suggestion … digi scrapping kits are really short on Grandparents … it would be GREAT to see a grandparent theme or generations, heritage … but definitely grandparents with people … the grandparents, the kids, babies, wordart of Grandpa Grammy, etc. love your Family Tree kit … this could expand that. and you did a great grammy (the queen) in your Great Britons kit … i think this would be wonderful!!! hands up for Grands!!!! As you know I am your biggest fan in the Southern Hemisphere. I would LOVE to see some doodles that represent Sunny South Africa. Congratulations Kate!! Who 11 years. I would like to suggest that you look at standard holidays but do them from the perspective of people from the southern hemisphere. I love Sunny Santa but it is so hard for things like easter and other events when our seasons are the opposite. I love Cool Britannia and would love to see other cultural themed sets. I would love to see a kids crafting or engineering set that shows kids working through problems. We do a lot of building, but the parts that are sometimes hard to solve are the emotions, such as when your project falls apart or when you disagree with your team. I would love to see something showing that we could use the some sequence of events from frustration/anger, sadness/failure, teamwork, perseverance, success and happiness. Happy designiversary, Kate!! I love your doodles since the beginning, and I think I miss the button bits, stars, cardboard hearts…maybe you could bring them back! Congratulations an thanks a lot for your creative work. I love your cliparts. 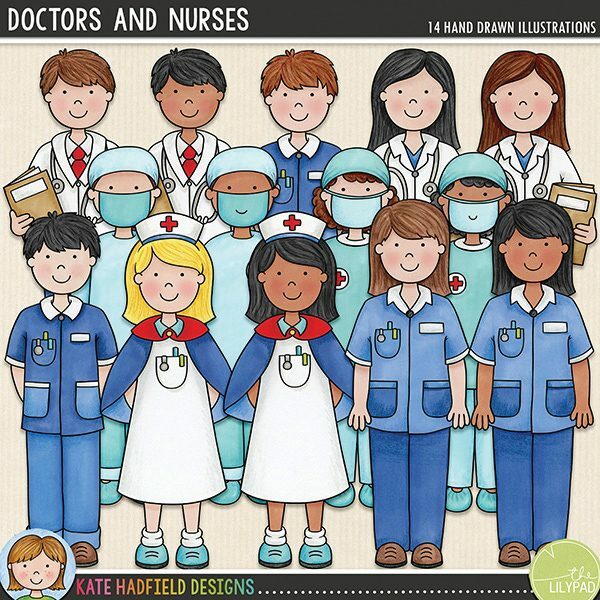 I create illustrated projects and resources for my students. Congratulations on your Eleveniversary! I would love to see a theme park/carnival/ fair set.. something along those lines, rides etc. Happy 11th Designiversary!!! I’m pretty sure I have most of your doodles…except the past year or so since I haven’t had the time to scrap much at all! Hoping to get back sometime this year! 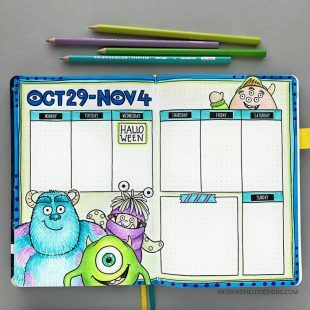 I would love to see more Disney themed doodles from you! Happy 11 years! I’m a teacher (STEM) and would love to see you work your magic with a set of “icons” that go beyond the typical social media ones, are similar in style to your wonderful “loved up brads”, and communicate in an instant. Happy Anniversary! While I loved the Fiesta Fiesta! set, I wish for a Southwest or Santa Fe set, focused on New Mexico: Barrel cactus (with flowers), Prickly Pear cactus (with flowers) NO Saguaros; Pueblo houses, Turquoise gates in adobe archways, Greater Roadrunners, Green Chile peppers, Lavender, Red wine bottles & glasses, Indian Corn, Red Chile Ristras, Hot Air Balloons, Farolitos, NM Whiptail Lizard, Ravens, various Owls, Hummingbirds, Western Boots with Native design. Happy “Designiversary”! Love your artworks and I would very much to see a nautical themed doodles. Congratulations on your anniversary. Love your designs especially the digital stamps which I use for making cards. Would love a set about Australia with some of our rural images e.g. kangaroo, emu, gum trees, windmill, Uluru as well as some of our city scapes e.g. Opera House, Sydney Harbour Bridge, Adelaide steeples etc. Anything sunflowers & books related! Congratulations, Kate! I’ve been following you since the beginning, I love your work!!! Anything with horses and dogs are good for me 🙂 I wish you continued success in your creativity! Congratulations Kate. How about some Native American Woodland doodles. My four granddaughters are on the swim team so I would love to see a kit with a swimming theme! I love all of your art so it’s hard for me to choose just one! I guess Bundled Up and My Kid of Dog would be my favorites (at least for today, LOL!). Thanks for the chance to win and for sharing your work with us. Congratulations on 11 years! Thank you so much for all the freebies. I wish I’d found you sooner. I would love some nursery rhyme based doodles. Thank you for these super cute brads! I love your drawings and would be happy to see something waterpolo (maybe together with swimming, diving and synchro). HUGE congrats to you-and to us, for getting to use your amazing creations! I would love to see something with horses and children. I’d love to see something for the UK that is NOT all about London. Everything I find is about London, and the rest of the UK doesn’t look anything like London. Note: the UK includes Wales, Scotland, the rest of England, and Northern Ireland. Congratulations! I would love a “Walk in the Woods Bundle”! Happy 11th Anniversary. Thanks for all the inspiration. I would love a set for the fairy tale, The Musicians of Bremen! Congratulations on 11 years! I’d like to see a horseback riding kit. CONGRATULATIONS on your Eleveniversary!!!! oh gosh .. that means i’ve been following you for ELEVEN years!!! good grief! i hope you have 11 (plus) more!